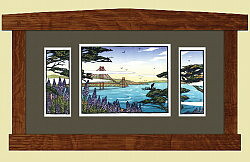 Based in the Pacific Northwest, The Arts & Crafts Press was founded in 1996 by Bruce Smith and Yoshiko Yamamoto. 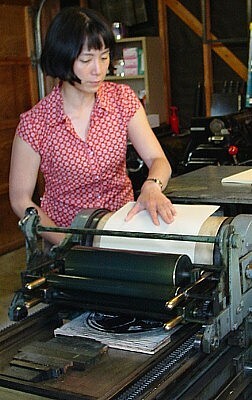 We specialize in crafting letterpress printed note cards and limited-edition block prints. We work with the belief that art is not an object, it is a way of life. We strive to create things of beauty by using our head, our heart, and our hands. The title of this print is "Waterlilies I"
"The new �Waterlilies� triptych is a perfect example of my continuing exploration of the same subject. I made a Koi Pond print over ten years ago based on the memories from my childhood in northern Japan where I secretly dipped my toes in my grandmother's koi pond and I was allowed to feed the huge koi fish. More than anything, though, for hours I just sat there, watching the dappled light and patterns of swirling water. 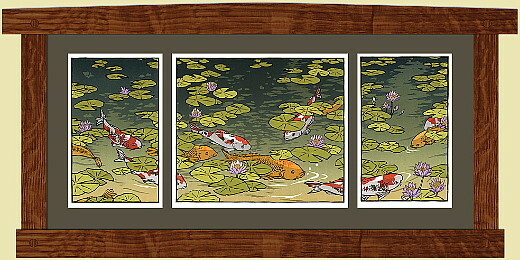 I do like the first Koi print from a decade ago still. Yet I wanted to work on it again, this time with more fish, with waterlilies, with more mysterious dark ripples where these brilliantly-colored fish hide. Like Claude Monet�s obsession with his lily ponds in Giverny, I�m fascinated by the interplay between the light and the dark, � the seen and the unseen. In the dark murky water, all the wonderful memories remain in my subconscious. But occasionally an image or two from the past float up to the surface with such clarity. Where there�s darkness, a shadow; we cherish life�s fleeting brilliance. This linoleum block print was printed from 19 layers of colors using hand-carved blocks and photopolymer plates made from hand-cut stencils. Each color was hand-printed on acid-free 100% cotton Cranes Lettra paper. Printed with Charbonnel ink, using Vandercook 4 printing press." 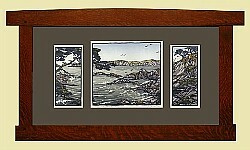 Please scroll down to order as well as shop Yoshiko's other triptych block prints.